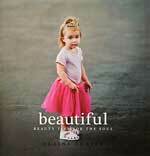 Beautiful: beauty tips for the soul is a book that invites and challenges the accepted view that beauty revolves around a person's outward appearance. "This book challenges feelings of insecurity and the belief that you are not pretty enough..." Beauty is the whole package: body, soul and spirit. This book concentrates on helping young women to develop character, strength and resilience, which in turn creates a beautiful character. This relates to a journey from who you are created to be to fully living out your potential as a young woman. Every chapter has stories and beautiful photos. They include a section called SOAP - a group of Scriptures to reflect upon, an Observation, an Application and ends with a simple Prayer. "In our increasingly superficial culture, Elaine's words refreshingly remind us of true beauty - the character of Jesus Christ. Its anecdotes are honest and real, with no attempt to trivialise life's significant challenges or to gloss over personal failings. It is the wonderful journey of discovering a 'Personal' God with perfect plans and purposes for all humanity. Human transparency and Divine revelation of truth fill the pages. I highly recommend it!" - David Bonanno, National Director, Youth for Christ Ministries.